One of the most common questions I get about the vegetable garden is how to stop the yellow leaves that begin on the bottom of tomato plants and move up the plant to ruin the production of food. Almost everyone's plants get this fungal disease at some point, but organic growers have far less problem with it and it tends to hit their plants later in the season. It is often misidentified as spider mite infestation because those pests will sometime attack as a result of the stress caused by the disease. It is a fungal disease that infects ornamental plants, fruit trees, tomatoes, potatoes, peppers and shade trees. Brown to black spots form and enlarge on lower leaves developing concentric rings like a target. 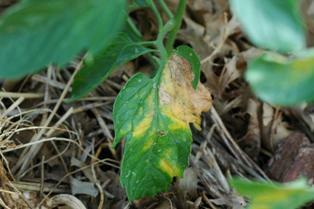 Heavily infected leaves turn yellow, dry up and die as spots grow together. 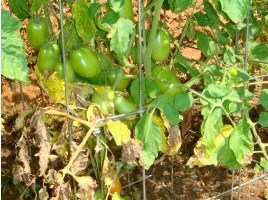 Target-like, sunken spots will sometimes develop on tomato branches and stems. 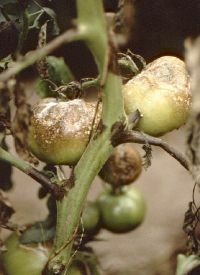 Fruits other than tomatoes and some tubers can also develop this same disease. Spores are carried by the air and are a common cause of hay fever allergies. You can control this disease by planting resistant cultivars and soaking seed in a disinfecting solution such as a hydrogen peroxide mixture before planting. Soaking the seed in Garrett Juice also seems to work. Proper organic bed preparation helps greatly. Spray plants with Garrett Juice, treat soil with whole ground cornmeal and spray infected plants with BioWash. 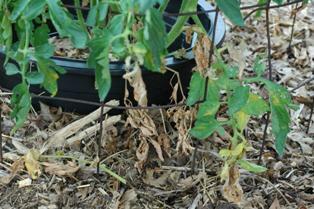 Bio Wash sets up a condition on the plants that the disease organisms can't survive. The best long term control is to prevent the disease by planting well adapted varieties in healthy, biologically active soil and spraying and drenching the root zone with Garrett Juice. If you have any questions regarding this newsletter or any other topic, join me this weekend for my Dirt Doctor Radio shows..